The exhibition of vividly colored, precisely executed works—based on letters of the alphabet and made in 1964 and 1965--is the latest in a series focusing on specific aspects of the artist’s long and remarkably productive career. Their titles are numbers, not letters, and the letters that inspired the paintings are not necessarily apparent. Occasionally a big blocky F, H, I or T pops out, but it may be upside-down or sideways. The letter may appear with a mirror image of itself, or as part of a negative/positive space relationship with another letter of the alphabet. 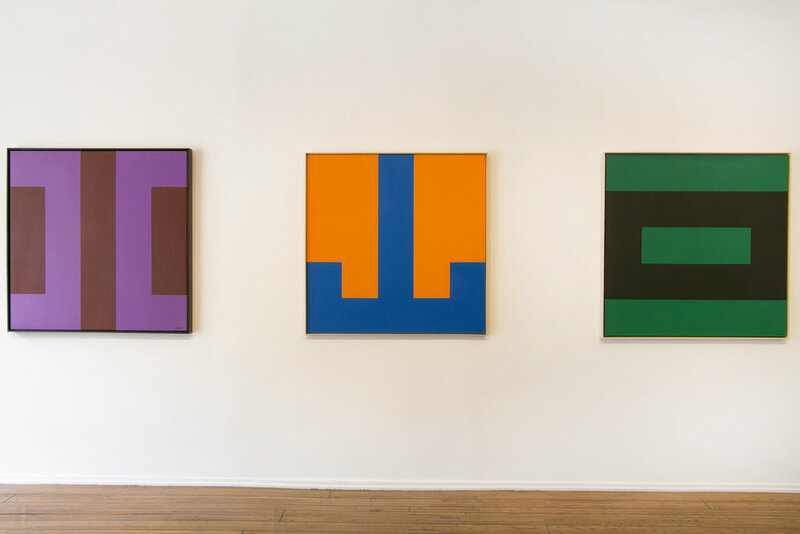 Although the alphabet paintings are relatively simple--limited to a few chunky shapes in two or three hues--the reductive quality of the compositions makes the juxtapositions of color seem all the more powerful. Louis Stern Fine Arts is the exclusive representative of the estate of Karl Benjamin.